Letter a line from each song with us on Instagram! Where you part of the small group of us lettering in November as we geared up for the Gilmore Girls release? Do you want to keep working on your lettering skills? Well, I do... and I have gained a few more friends on the journey, so yay! And this time around, I am ready to really soak in the Christmas songs... who's with me? So here is the plan, until Christmas Eve there will be a song of the day, and you get to pick any line, or even the title, from the song to letter, doodle around, or create your own kind of art for. Then share a quick snapshot on Instagram! Because there are going to be prizes!!! YAY!!! So there will be three winners - one winner will get a pair of adorable button earrings from (Jen's Store), one winner will win one digital print from (Rhiannon's store), and one of you will win $10 Amazon gift card to buy your own new writing gear (or whatever you want). So that means, you need to be over 18 to enter, or have your parents permission, and the winner of the earrings will have to be in the USA. See below for more of the rules and fine print... cuz it's too boring to all put up here! 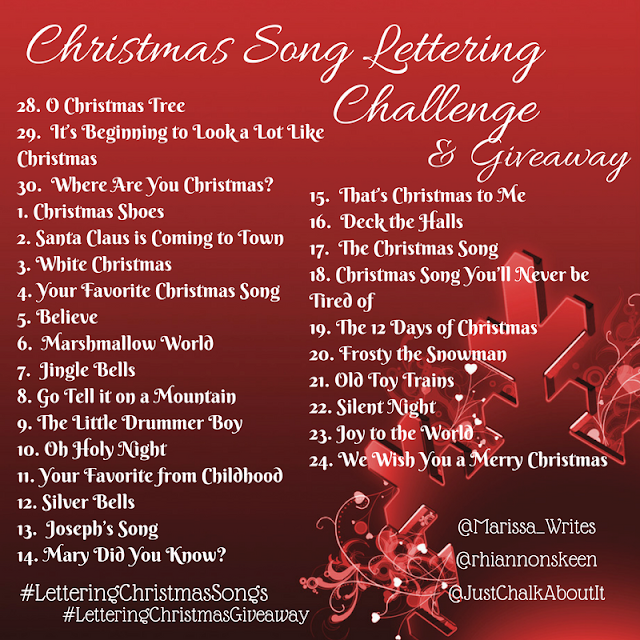 As I mentioned, feel free to pick any line, or phrase, or even the title of the song as your lettering/art/doodle. And this about fun, not about perfection. So if you are new, don't worry. You are welcome to join in at any time. Just make sure when you post your pick you use the hashtag so we can add you to the giveaway for each of your entries. 30. Where Are You Christmas? 14. Mary, Did You Know? Here are the main details... feel free to join in! Want to join in? Click here to see my Instagram details! Oh, the choices on this were just as hard as the last time... I hope you all have your creative minds working because I am ready to be wowed!